Home » Recipes » I challenge you to find a more surprising, delicious, easier, less expensive meal! 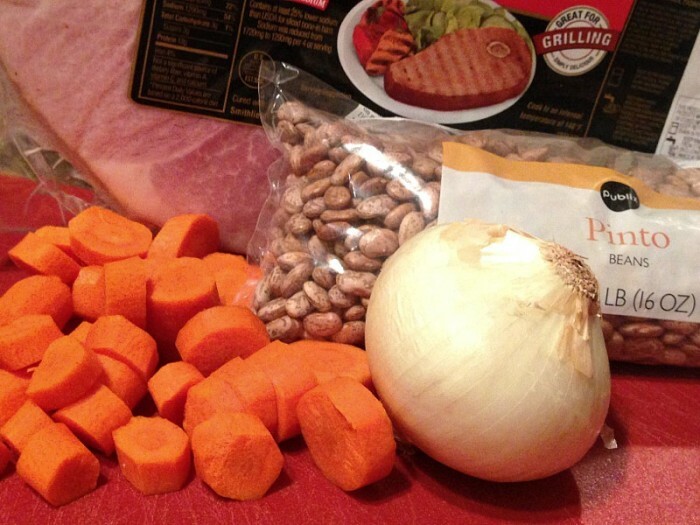 I challenge you to find a more surprising, delicious, easier, less expensive meal! Fresh tomatoes. Yes, many are calling to revoke my Southern card over this one. I can tell the difference between “good” and “bad” ones, I eat ’em chopped and seasoned in salsa, I love marinara and all things Italian…but I will not eat tomatoes in salads or on sandwiches or burgers (grape, plum, cherry, Roma, Beefsteak, Heirloom or WHATEVAH). This is why my husband says I’m complicated. Cucumbers. Fresh from the vine or pickled into, well, pickles, I can’t stand their flavor. People try to tell me, “But you can’t even taste them,” which is a lie from satan’s pit because WHY WOULD YOU EAT THEM if their taste is invisible? Blue Cheese. I recently learned the hard way gorgonzola tastes more like Blue Cheese than what I was expecting–Feta or Goat Cheese. Why I had all these soft cheeses confused escapes me, but stinky cheese tastes like it smells. Gross. Citrus fruits. Love their juices, canNOT stand the texture. I hide ’em in smoothies. In recent years, I have picked up a few new favorites, i.e., cole slaw, fresh salmon, pimento cheese. Once I learned that salmon does not taste like the odor it emits from escaping oils, I was willing to try it. My loss all those years. You can imagine when we lived in Germany a year, my taste buds – and resolve – were tested. While I was willing to try new foods, no one could convince me to budge on my Ick List. And, really, why do people care so much when your food tastes don’t align? I’m also a visual eater, so if something doesn’t look appetizing, unless I’m sitting around your dining room table and I HAVE TO EAT IT out of sheer politeness, well, fuggetaboutit. Like if you offered me cow’s tongue or liver. Organ meats scare me. And then there are the foods with known gastro-intestinal consequences. Really, those should be an excused absence, right? One of the worst things to learn the hard way is the idea that Chili with beans is a good thing to fill up a house full of teenage boys. There will be unpleasant consequences for the mother, but free entertainment for the boys. So, maybe that’s why I’ve never tried Pintos; I thought they’d wreak havoc on my stomach and my decades-long record for Full Body Control would be at risk. On a whim after Thanksgiving, it was in a spirit of good stewardship when I decided to make Pinto Beans using the uncuttable end of a spiral-sliced ham for flavor; I’m embarrassed to admit this is typically thrown away. All I can say is I’ve wasted a lot of ham stubs through the years, once again to my loss. 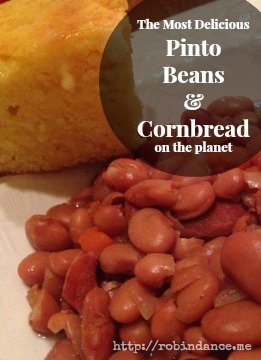 Those Pinto Beans were so ridiculicious, I’ve been raving ever since! For under ten dollars and with only a few ingredients, you can make a high-protein, inexpensive feast…and surprisingly, there were zero gastro-intestinal side-effects. Who knew? That was almost as nice a surprise as discovering the meal itself. Here’s how I made ’em; let me know if you try ’em and if you share my enthusiasm. 1. 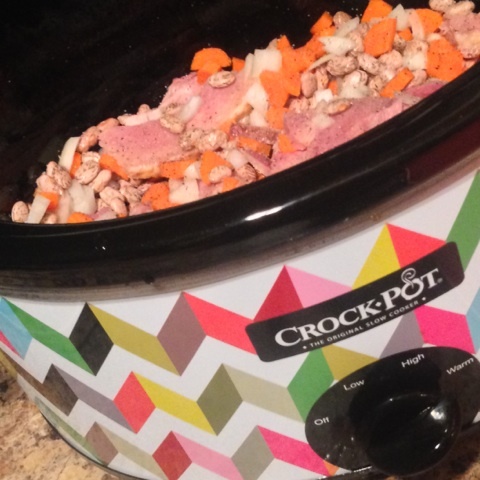 Set slow cooker on high; spray sides with Pam for an easier post-meal clean-up. 2. Throw in all the ingredients except hot sauce. 3. Heat 10 minutes; reduce heat to low and cook 8-10 hours. 4. Book yourself a spa day with all the money you’re saving on food for this meal. 5. Served topped with diced onions and hot sauce, if desired. I’ve tried cornbread many different ways and right now I’m loving Golden Cornbread using Martha White Self-rising Yellow Corn Meal Mix. Yummo! ** I don’t always have ham on hand when I crave pintos; I found a cheap alternative by buying a single, thick slice of ham, and it was DELICIOUS chunked in with the beans! ** This recipe is adapted from Publix Apron’s Simple Meals; theirs is a soup recipe and calls for 8 cups of water. However, when I made this, I reduced the amount of liquid and it was more stewy, less soupy. Your question about sorting beans made me remember the many times my mama did this, and it was to make sure and get the small rocks pulled out. I still sort them before throwing them in the pot, and from time to time I stumble on a little rock. Love the recipe, will have to try it out! I am 100% with you on how you take tomatoes. I have TRIED to make myself like them in my adulthood; alas, I cannot. It makes me sad and the source of much ridicule but you’re right – who cares? Why is it a big deal? Of course this from the girl whose husband will not eat squash of any kind, asparagus, mushrooms, cream cheese, ranch dressing, sour cream, and several other things I probably forgot. And I might harass him about it a little bit. I don’t like tomatoes either. I will eat diced tomatoes in chili or other recipes, but not on hamburgers, etc. My rules for eating after many years of living across the country & overseas… nothing ugly or gourmet which has held me in good stead. I do not eat pinto beans. I am from the South. I think they taste like dirt, worse than then a speciality tea from the northern regions of Korea. 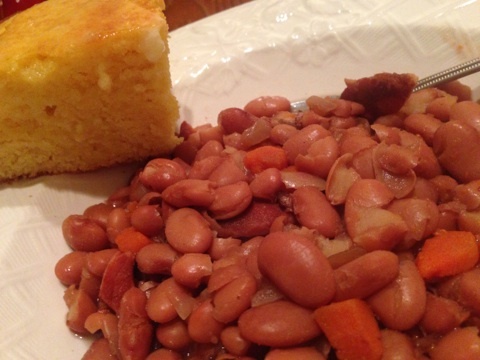 We always had navy beans and skillet cornbread. Then I married a Yankee. Our ideas about “bean soup” were never reconciled so I go to Cracker Barrel. Don’t worry; we have reconciled all our other regional differences!